Below is a chart briefly summarizing students' evaluation of my teaching while at Wayne State University. While I don't believe these numbers tell the whole story of my work as an instructor, I do think they keep me honest as well as help me to reflect on and evaluate my pedagogy. Revisions to course content and procedures over AY 2014-15 clearly delivered a better learning experience for my students. 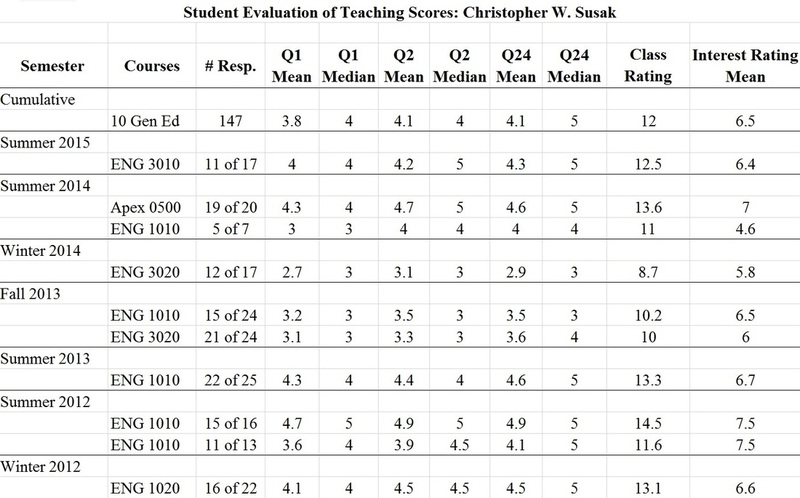 I would encourage you to not only review the excerpted ratings and comments below, but to also read my complete score reports attached to the bottom of this page in order to get a more comprehensive look at how students have evaluated my teaching. Q1: "How would you rate this course?" Q2: "How much have you learned in this course?" Q24: "How would you rate the instructor's teaching in this course?" Summative Class Rating: The sum of the responses for Q1, Q2, and Q24 gives an overall rating of the course. ​Mean Interest Rating: This number (out of 10) is used to gauge student interest in taking this particular course as well as the subject matter of the course. Of course, student interest (or lack thereof) has a small impact on their evaluations. Finally, my comprehensive SET reports include evaluations of the Organization/Clarity of the course, Instructor Enthusiasm, Group Interaction, Individual Rapport, Breadth of Coverage, Examinations/Grading, Assignments/Readings, and the Workload/Difficulty. "I took very valuable lessons from this class and experience and I could not be more thankful, so a huge thank you is extended to everyone [in the class], especially to Mr. Susak who always believed in me, considering I have never believed in myself."